Constellation HomeBuilder Systems would like to welcome all builders and remodelers to the 2010 International Builders’ Show in Las Vegas. We have an exciting show planned with many experts available to answer your questions about our products, recent acquisitions, and real-world best practices. To register for these sessions, please click on the session name in the schedule below. Over the past year, we have seen huge changes in our industry and technology in general. While many builders were focused on their business and making many tough decisions, we were focused on providing world-class customer service, enhancing our products, and developing or acquiring new technologies to meet the needs of the changing home builder, home buyer, and home owner. To meet these demands, we have released major enhancements to our core production, accounting and sales solutions, completed two significant acquisitions, developed two new products, and offer many of our products in hosted configurations. Our track record with new acquisitions demonstrates Constellation’s commitment to customers with world-class service and ongoing product support and enhancements. This means that home builders can rely on Constellation for stable products, dedication to the industry, and proven expertise. With more than 100 employees focused on homebuilding software, and over 2,400 customers we are the largest software company in the industry with the resources to deliver mission-critical solutions for home builders of all sizes. With several booths at the show this year, please be sure to stop by to share some stories, or just ask our experts a few questions. We would like to learn more about your business and offer our assistance in any way we can. Just a quick announcement to let everyone know that the recording from our online marketing prospect follow-up session with Mike Lyon is available for viewing. In this presentation, Mike does a great job talking about the changing habits of new home buyers and explains some practical approaches builders can follow to increase the number of new home sales. Fortunately, Constellation has sales and customer relationship management (CRM) solutions to help with this. We can bring prospect information from your website into your sales system automatically, provide website redesign services, and even help builders go live with a new website very quickly. For example, Kaplan Companies and Stylecraft Builders have used our services to create some amazing websites that are optimized for search engine results. We would like to thank Mike for conducting the webinar. He speaks with authority about the conversion rates a builder can expect and best practices that can be implemented to boost sales from internet leads. He is also the author of Browsers to Buyers:Proven Strategies for Selling New Homes Online, the home building industry’s authoritative guide on internet marketing, lead generation and leads management. To learn more about Mike and how he can help your organization, you can visit www.doyouconvert.com. 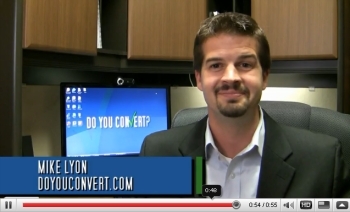 Presenter: Mike Lyon – Do You Convert? Click here for your video invitation to this event. The session will be presented by Constellation HomeBuilder Systems and Mike Lyon and will feature a detailed presentation, product demonstrations and an opportunity for questions. After you register for this session, all participants will receive an email confirmation via WebEx confirming your registration with an event URL and event password. If you do not receive a confirmation, please contact Cathy Kotsopoulos via email or by phone at (888) 723-2222 ext 6140. Constellation Software Inc., Acquires The Enterprise and the Homebuilder Web Development Group Assets from MOVE, Inc.
Toronto, Ontario, August 4, 2009 – Constellation Software Inc. (“Constellation”) (TSX: CSU) announced today that it has completed, through its wholly-owned subsidiary Constellation HomeBuilder Systems (“CHS”), the acquisition of certain assets and liabilities of the Enterprise and the Homebuilder Web Development Group (“The Enterprise”) from Move, Inc. (Nasdaq: MOVE), the leader in online real estate. The Enterprise, based in Milwaukee, WI, develops custom Web sites for real estate brokerages and homebuilders. Product offerings include web development, interative voice response (IVR/Hotline) systems, and television production solutions. Constellation’s common shares are listed on the Toronto Stock Exchange under the symbol “CSU”. Constellation Software in an international provider of market leading software and services to a number of industries across both the public and private sectors. Constellation acquires, manages and builds vertical market software businesses that provide mission-critical software solutions to address the specific needs of its customers in those industries. Move, Inc. (NASDAQ:MOVE) is the leader in online real estate with 8.3 million(1) monthly visitors to its online network of websites. Move, Inc. operates: Move.com, a leading destination for information on new homes and rental listings, moving, home and garden and home finance; REALTOR.com, the official Web site of the National Association of REALTORS; Moving.com; SeniorHousingNet.com; and Top Producer Systems. Move, Inc. is based in Westlake Village, California. Chief Financial Officer, Constellation Software Inc.
Constellation Builder Broadcast is a complete e-mail marketing solution, providing an economical, results-oriented solution for home builders of all sizes, whether you build 5 houses a year or 10,000. Now, more than ever, it is critical to know as much about potential home buyers as possible. You would never send the same e-mail to a home buyer as you would to a real estate agent. Constellation Builder Broadcast offers affordable tools to send timely, meaningful communication to your prospects and customers that will help you get referrals to help increase sales. Collecting and managing e-mail addresses is just the beginning. Beyond simply sending the e-mail messages, Constellation has prepared a best practices guide for e-mail marketing. This guide, along with Constellation Builder Broadcast will help you optimize your e-mail campaigns, and effortlessly keep your campaigns in compliance with junk e-mail regulations. Built-in best practices for e-mail marketing and campaign management, designed to increase prospect-to-customer conversion ratios. Build strong, trusted relationships by staying in-touch with your prospects, ensure delivery of the messages you want them to read, and encourage them to make a purchase decision. Measure e-mail marketing effectiveness with insightful reporting, tracking and analytics to determine content relevance, timeliness, frequency and overall performance of your e-mail marketing campaigns. See how you can stand out from the competition with polished, professional, and highly relevant e-mail marketing campaigns. Markham, ON, July 20, 2009 – Constellation HomeBuilder Systems, the largest provider of homebuilding software, is pleased to announce that Constellation is the winner of the 2009 Innovative Housing Technology Award for Constellation’s BuildSERV Ownership Guides under the Front Office: Sales & Marketing category. The award program, owned by CE Pro, TecHome Builder and Electronic House magazines honors the most innovative products, builders and CE pros serving the homebuilding industry. A panel of tech building industry experts and journalists evaluated the 2009 finalists and made the tough choices. The winners represent best practices by CE pros, builders, home technology makers and IT innovators. Visit www.techomebuilder.com for product information and slideshows of the winners and award finalists. Constellation Sales was nominated as a finalist. You are currently browsing the archives for the Constellation CRM category.